Tonight I’m taking a timeout from art for a timeout for art! A full day of painting leaves me tired, yet when I switch to pencil, I quickly float away in a meditative trance! It’s as if I am asleep with my eyes wide open! I could draw all night! This pencil study is in Alastair’s behalf; last month he tackled a complex design, which challenged me to break part of it down in an analytical method. I sharpened three or four pencils and shaded the negative space with a light touch. What started as a stiff drawing quickly became an easy design that required attention to detail and patience. I admire Alastair for attempting this drawing, even if he trashed some of his attempts! We learn a lot about our subject matter – and about ourselves – when we draw or paint the same thing more than once. The longer I worked, the more nuances I spotted. I switched pencils often and kept the points sharp. I rarely use an eraser. Shading lightly, I was able to make most of the lines in the image disappear. When drawing, remember that the negative space is as important as the subject matter. Drawing helps us to see what’s really there! Last week when traveling, I finished the drawing of the snowy egrets. Thanks to all of you who contribute art/drawings each week! I will be away from home for another week to ten days, but look forward to when I can showcase everyone’s drawings from the past few weeks. I’ll trade my pencil for my paintbrush in the morning and resume work on my friends’ patio. The sunflower painting will brighten the utility room. Break out your pencil and paper today and lose yourself in a drawing! Have fun; I look forward to seeing your work! You are welcome! A friend wrote to say that she followed the link and then enjoyed a leisurely visit through your site! She enjoyed your posts! Sometimes it takes ten of fifteen minutes of drawing before we can actually see what is there. if you really look/compare my drawing to your photo, you’ll see that some of the negative space is a bit ‘large.’ If I had had time, I would have drawn it again to nail those areas. In my mind, the corrections were made, so I grew a bit in my drawing skills. When you did the lines, the squares, did you use a ruler, or a just freehand? freehand, but as i drew it, i pondered using grid paper.. the center cross is not quite as wide as the other lines, but they are all parallel and square… why don’t you plot it on grid paper first – just the drawing, then switch to regular paper for a serious shading challenge? if it turns out great, you will wish it were on plain paper and not grid paper! do a few minutes of warmup of drawing cross hatching or parallel lines then perpendicular ones. then switch to your drawing. warm ups really help! good luck! Thanks for this lovely post, including the great quote. Hey, thanks so much! I’m glad that you enjoyed the post at the end of a long day/night! Drawing with pencil is very calming, and I am glad that it gave you comfort as well! i’ve never done an entire drawing w/negative space, but i often prefer using negative space when drawing. it makes it easier to truly see what is there and not what i think is there. Do the colours you use remain bright for a lengthy period? The UV light here just devastates everything very quickly. i have noted that some colors stay strong and others fade fast. the fuschia colors of bouganvialla often fade fast, and i find myself going back and repainting! oranges stay strong, as in heliconias, and greens/blues do well. this particular project is on the wall that does not receive direct sunlight, so it will ‘weather’ well. they also plan to put a clear-panel roof over that area. i plan to start brushing a non-yellowing floor sealer on the outdoor art and will see if that helps protect the colors. i should do a test – soon! while i was painting, sarah went to the fereterria and bought a non-yellowing finish for concrete floors. it also has UV protection! yes, we learn with each new project! I love the snowy egrets (especially)! good morning! thanks so much – i need to do a serious drawing of the egrets; they are so dramatic against a dark background. I passed a link to this post on to another artist in the Seattle/Portland area. She does a good bit of drawing and also works in watercolors. Very recently she did a series of 100 drawings of the same shell. Obviously, what caught my attention was your comment about drawing or painting the same thing more than once. Beautiful patio, by the way. Those hummingbirds are splendid! thanks for passing the link, and wow, that is surely an interesting series of drawings. we’re having fun with the patio project. some of the bird and butterfly designs were influenced by sun catchers, pottery, or other pieces of art in her home. Lovely! I have to find my pencils and pads of paper! good morning! i’m running late (b/c i stayed up so late) but look forward to enjoying your queue of posts. i feel like i’ve abandoned ‘let’s be wild,’ but i have had zero free time to check out the weekly challenges. in another few weeks i will be home again! until then, i’d best paint while the sun is shining! Oh, Wow! Those white egrets are amazing, Lisa. Love your work. thank you! they were so ‘plain’ when they were strictly line drawings. the background makes them pop! You are wonderfully productive! Very inspiring, as always…thank you! thank you, cindy! you appear to be very productive as well! it’s my loss that i’ve not visited your blog lately, and today the mural calls.. hopefully tonight! you are such an inspiration. thank you! i look forward to doing some serious work/drawings on good paper.. these drawings have been on very thin paper with zero tooth, but the act of drawing is always comforting to me! welcome back! i will be mia in about five days but will be settled back home in early july… i think! Artist, of all genres, are angels from paradise sent to Earth to sooth our earthly journey. Thank you Ms. Z.
I really appreciate your patient instruction and encouragement! Great job on the shading and negative spaces. I am learning more each week as I try and try again. Thanks. Elegant egrets. And so nice of you to work with Alastair. I’m a little confused though. Are we suppose to post our attempts and then put a link on your blog? Have a safe (fun) excursion. as far as art, it really doesn’t matter to me what medium, what subject or approach.. it’s just the joy of creating and sharing with others that counts! in about five days i will be offline for a week – a trip into the amazon- so i’ll put the following week’s post in queue to be published while i am in the wildderness! Thanks, Lisa. I only did my bee on the clover so far, and thought I posted it on your blog, but I guess I did something wrong (again) but I’ll work on something else and try again to link it. i’ve noticed that many ‘pingbacks’ don’t reach my blog. there seems to be no particular time – sometimes the y come through and sometimes they don’t! i’ll go to the site and click the link, and it goes to the right page, and i have the setting selected to receive pingbacks… but who knows why it does or does not work at times! i’ll be heading back over to your blog in about half an hour! Oh Lisa what an amazing and interesting life you lead. Thank you for the negative space tips I will try that this week. The Amazon is a word that brings so many images to me of impenetrable jungle and wild animals. It is a place I have always wanted to visit. I look forward to seeing it through your posts when you get back home. Have a safe trip my friend. Si; I am painting today and tomorrow, then monday will be ‘get ready’ day, and then tuesday(i think) we will be off to the amazon! we will be away from internet, but wow, i will have to zip myself away for weeks in order to catch up! i read last night about severe cold weather there.. is that affecting you? The weather in Hobart is only 2c-12c but when the sun is out is ok, invigorating, but we wrap up warm. The negative shape between the snow egrets is pleasing and with imagination other animal silhouettes can be seen. As I generally sketch free hand when the imagined negative shape appears the same as that in the subject I know I am on track. The pattern on the box I am going to play with and make a knot pattern out of it. Thank you, I am playing with paper and pencil instead of TV. I love when I am lost in shading the negative space, and all of these new images appear.. One rolls into those new images and enjoys following the trails. It’s obvious that you enjoy those lapses as well. Those recent drawings have been on very cheap paper with zero tooth, but I love working on better paper which nudges me into more of the nuances. I need to take a week time out at some point and strictly focus on strong drawings. They are such a comfort! What a wondrous world, there are so many ways to look at things. We can look at the patterns in nature, the abstract forms things suggest and the compositions angles make. The subject can become secondary to what our imagination conjures up. You are an artist giving to others, I appreciate much but achieve little more than the joy of doing. Yes, yes and yes – fantastic points, as a painter artist I tend to forget when returning to drawing. Wonderful drawing and would have taken me at least 2 hours – beautiful piece and love the shading. The Egrets are out of this world, you achieved a 3-dimensional look – you are an artist, artist. The best! thank you amiga.. presently i am an artist with a late-night charley horse in my shin… yow! shutting down the computer and going to hobble this one out! If you eat some nuts, almonds, they tend to help with leg cramps (or so we’ve been told). hey thanks! the cramps ended up hitting both legs – i jumped and hobbled around for five or so minutes then went to sleep! i’ll try to stock my bags with some almonds – in case of emergency! Indeed-many sides to each line-terrific post! thank you! what we see depends on what we are drawing/painting.. when i focus on negative space, then negative space jumps out at me from all directions..
What a good post this is, love the two drawings so professional looking, hope mine look like that some day. Love the sun flower and all the decorations. it’s not late in my book! any day, any time, any subject, any medium is fine with me! i treasure your posts, always full of energy and beauty. the poetry in two languages, side by side is always an added bonus. Negative space and drawing trees. thanks ruth! thank goodness your posts come into my email. it’s odd, sometimes pingbacks arrive and sometimes they’re AWOL or perhaps MIA! You are brilliant Lisa! I am beginning to see that pencil sketching may be therapeutic for me. most likely you have HB pencils around the house, and that’s fine for now..
i look forward to hearing how your first experiments are going! you are so welcome! i just told lynda if she doesn’t want to post her first results, she can email me and i can help,critique,suggest, etc…. artists have sensitive souls and sometimes aren’t ready to share their first images with the world! Long ago when my mother was ill, I often took my pad to the hospital and drew while sitting with her. She knew that I was totally happy sitting close to her while also happily absorbed in my art. I hope that you find the same comfort. You will also find that years later when you look at those drawings, you will most likely recall the day, the weather, the conversations..it records so much more than a camera! Wow! This is an incredible post sharing about your skills and helping us all explore our own. 🙂 I adore your egrets, and the steps leading up to your celtic knot are very helpful. One of my own favourite pencil drawings I did was of a swan on a dark lake as I explored focusing on the negative space. You’ve inspired me to give it a go again, as drawing is soothing and truly therapeutic. I’m so glad that you enjoyed the post. I wish I could see your swan drawing! Every so often we create something and then step back and ask, ‘Did I really do that?’ it’s a great feeling to know that we did something well! like a duck – um swan – in water, you’ll find those drawing fingers in a hurry! I look forward to seeing your drawings! Lisa, I haven’t begun this. I wanted to, but couldn’t let go. I still want to. How do I share my work with you when I finally let go of my mother’s harsh remarks? whenever my path takes me back to north mississippi, we have to spend time in person!!! you are also welcome to email your images to me if you don’t want to place them in cyberspace for the entire world to critique! believe it or not, entering competitions (long ago) helped me more than anything else. i realized that it all depends on the whim of the judges, and if they preferred abstract, then my realism paintings would not win favor….yet in another competition they might win best in show…all artists are sensitive to critique, but we learn to get thicker skin and create for the joy it gives us and not for someone else’s approval. . .
but wow, it takes a long time to reach that point, and harsh critiques still bruise a sensitive person’s soul! tzeebra at yahoo.com if you’d prefer to practice a bit before posting your results! 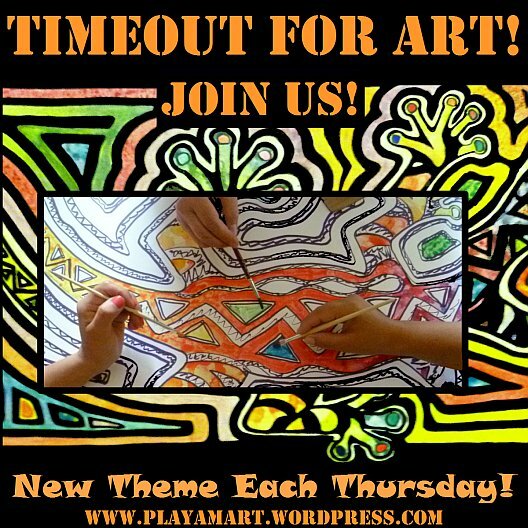 but when you do post, just link back to the ‘timeout for art’ of the most recent week. this week’s thought is about both sides of the line, but it doesn’t have to be about negative space.. it could be a drawing of a straight line! or a curved one that says, ‘waves..’ or ‘snake’… or a sunshine with a happy face! draw what makes you happy! This post has reminded me of one of my favorite art lessons that I liked to teach my little 1st and 2nd graders! I am getting that post ready next… it will have a drawing! Rudimentary perhaps, but this will be an easy place for me to begin. Thank you, Lisa. i loved the post!!!! thanks so much for sharing that great story! how lucky for those children to have had you as their teacher! Yippee! I look forward to your post! ah.. it’s like taking a nap and dreaming with eyes open. drawing does that to me.. painting is work! thanks amiga!